A contraflow was needed in College Road, Harrow, to help cyclists avoid the busy and unsuitable ring road system around Harrow town centre, and was campaigned for by Harrow Cyclists. Cyclists were using this section of wide footway anyway, to avoid a short one-way stretch of road which prevented direct cycling from west to east across the town centre, and were getting fined for it. It was a sensible and easy move for the council to put in a contraflow here, and, after a lot of campaigning, which included a publicity stunt where Harrow Cyclists laid a section of fake green, cycle track, they agreed, and earmarked £15,000 to be spent on the scheme. This is the result, just completed, which I photographed, unfortunately, at night. I really don't want to carp, but here we have a narrow track painted on the pavement with thick raised lines which goes through a sharp 90º turn to eject cyclists directly into the path of buses passing the bus station in College Road, when all they need is to continue in the same direction along the road. Why must implementation of such facilities always be so incompetent? There really should be no excuse for this kind of thing. We know that UK highway engineers seem often to lack any understanding of the requirements of cyclists, but there are guidelines for them to follow even if they don't personally know one end of a bike from the other. Sometimes these guidelines are inadequate themselves, but too often they are far better than what is actually delivered. This is absolutely clear and sensible. It also corresponds to the sort of thing I encountered on the Cycling Embassy of Great Britain study tour in Assen and Groningen last year, where we often saw Dutch cycle routes that would swap from segregated to unsegregated style because of changing road constraints, but always maintaining a high degree of continuity and smoothness for the route. Cycle routes in dense cities with many pre-existing street constraints are always going to have to adapt in this fashion, so it is critical that the transitions between on-road and off-road paths are got right. Strangely enough I have come across an example even in the Borough of Harrow where a track-to-lane transition has been done correctly. This short facility, which can be found in Whitchurch Lane, Stanmore, at the junction with Marsh Lane, actually works effectively (probably quite by chance) to allow cyclists to bypass the queue of traffic at these lights. To get the path to road transition right in College Road would have not have required any extra thought or research, it would have just needed the existing TfL guidelines to be followed. It would have required more digging, as possibly a phone box and some other street furniture would have needed to be moved, and a larger section of footway reconstructed. Whether this could have been done for the £15,000 allocated, I don't know. But you do have to actually do things to create properly-engineered cycle routes on existing streets, not just paint lines on pavements, put up signs and put in the easiest possible dropped kerb. Isn't it worth councils spending enough that their attempts at the simplest cycling infrastructure do not turn out as absurd fodder for the Cycle Facility of the Month website? 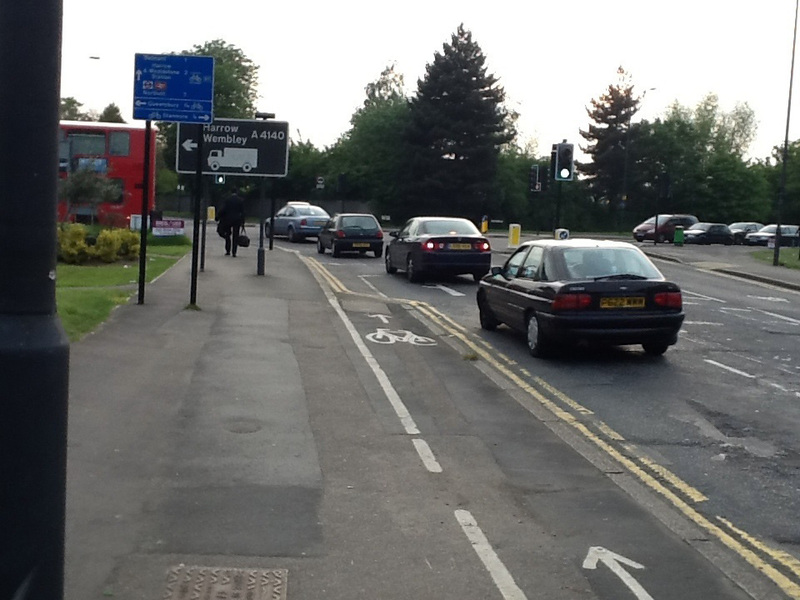 Come on Harrow, if you are serious about encouraging cycling, you should be able to do better than this. On one of my new routes home I've found an equally hopeless bit of off-carriageway cycle lane, basically in place so a cyclist can avoid waiting at a pedestrian crossing, by directing them onto the pavement BEHIND the crossing, putting them in direct conflict for people who will be crossing the road as they step onto the pavement. 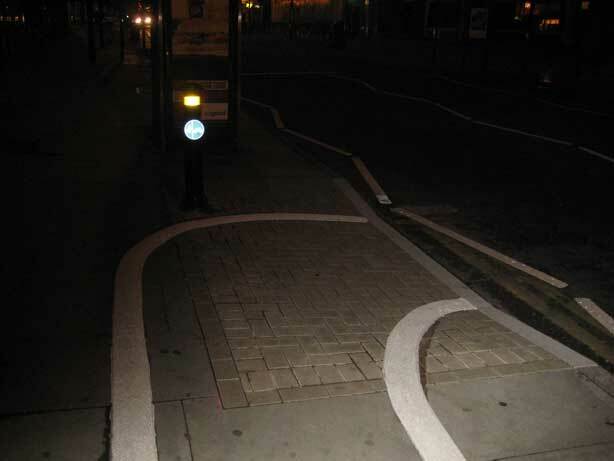 Are traffic engineers secretly competing to get into crap facility of the month? Seeing how far they can go before a councillor or contractor says: " Are you sure that's right?" I know journalists sometimes compete to get obscure words past sub-editors who are not in on the joke. The more stuff that gets built for cyclists in the UK the more I realise that its never going to happen here. I know that feeling CP. I have been involved in this for long enough – getting on for 20 years. What happens is that we occasionally convince some planner to do it right, or almost right, but then they move on in a year or so and are replaced with new people who don't have a clue. So we never make the real breakthrough. We never get the system right so that the correct design decisions get taken automatically, without a lot of banging heads against brick walls. I don't think we have really made progress on this for 20 years. That's why I support the Cycling Embassy, which demands clearly a whole new approach to cycle design standards. Hi David, I was wondering if you have any suggestion on cycling in Harrow? I've cycled in central London for the past 3 years and moved here recently, but find that it's harrowing to cycle in Harrow. Cars seem to enjoy accelerating towards pedestrian crossing, just to overtake me. I generally cycle quite close to the kerb unless I have to overtake a parked vehicle. However, when I overtake a parked vehicle on a cycling lane (always checking before I overtake), I sometimes have drivers insisting on overtaking me when there's traffic in the opposite direction as well. Thereafter, they will still point their middle finger at me. Do you have any suggestion what I can do to be safe? I agree it's awful. No surprise Harrow has the lowest cycling rate of any London Borough. The only answer is a long-term one I am afraid. Help LCC and Harrow Cyclists lobby for proper cycle infrastructure in Harrow that removes these dangers.